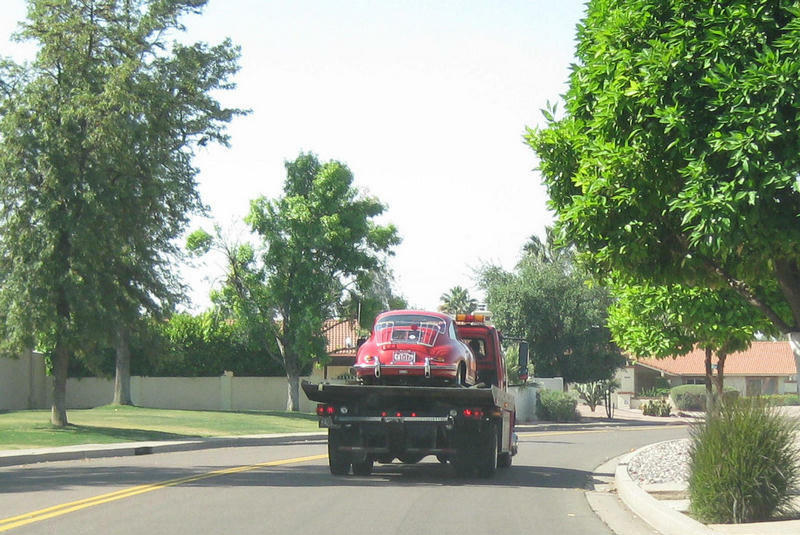 Every once in a while most of us 356 owners have to take their 356 to the shop! If they are real lucky, they can drive it. If they do something stupid, like I did, letting the car sit for six months, and the old gas gums up the works so it won't start, they have to have it towed! 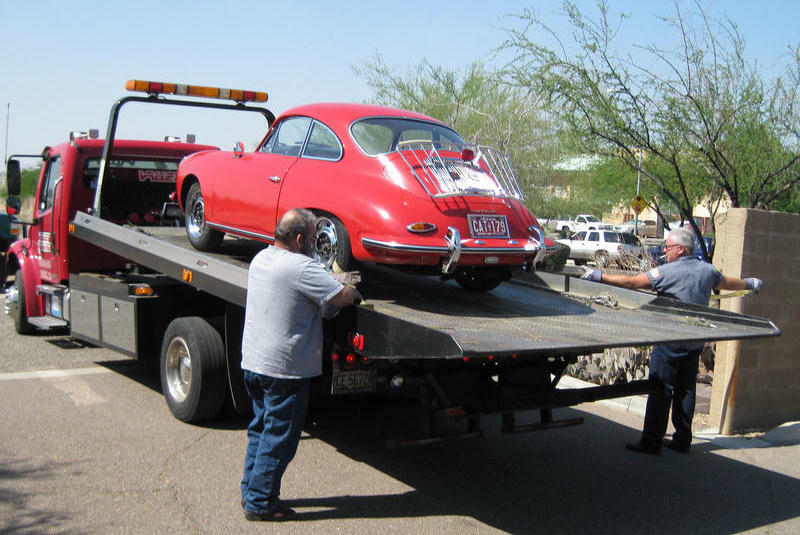 To the uninitiated, towing a prized 356 is a horrible thought! Tow my pride and joy to the shop, you say, NO WAY! 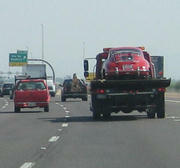 When reality sets in and it becomes obvious that there is no other way, they call a tow company. You've heard all the stories. The tow guys damaged the car on the way, or the car falls off the truck, or the car gets a few new dents, or the bumper guards get all scraped up. All kinds of things can happen! In my case, I did something stupid! I let the car sit undriven for about six months. When I went to start it, it wouldn't start. That much I knew would happen. So I tried my old trick......spritz a little gas in the carbs! And it did start right up.......but soon died when the gas was gone. Did this several times with no luck getting it running. In the past, doing this two or three times usually got the gas from the tank to the carbs and once started, it keep running! No way this time! I tried several times the next day with the same result. So I gave up. Now it started to sink in.........I was going to have to have the car towed! So I called Bill at Bill Richardson Restorations, and he was kind enough to save me a spot, and recommended a towing company. 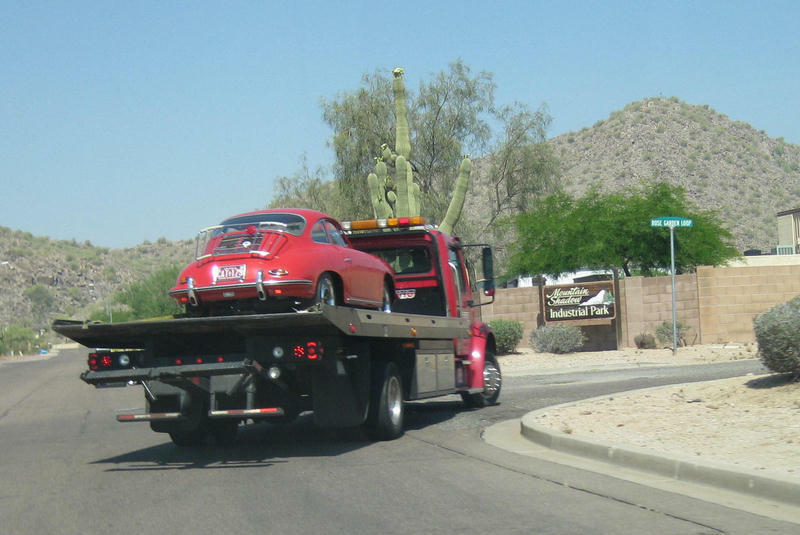 So now it was clear that I was going to have my 356-C towed! I actually lost some sleep over this probability! I imagined all sorts of catastrophies. When the day came, I was ready. 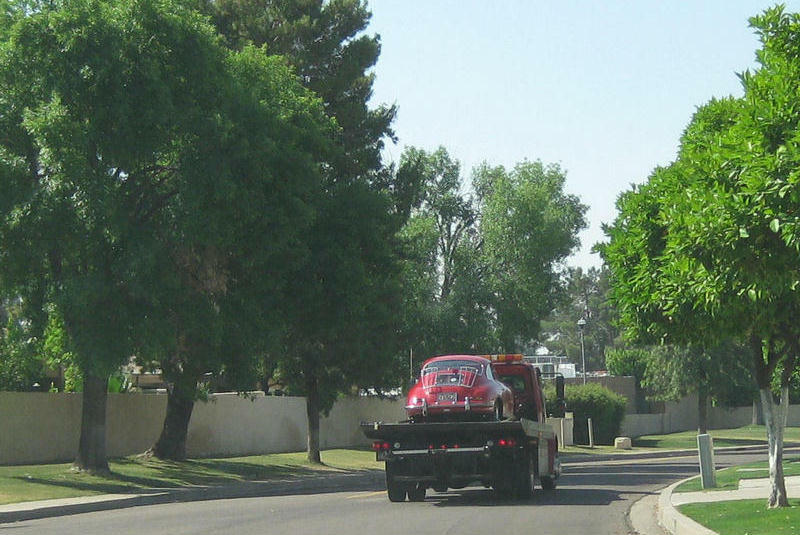 The tow job went off without a hitch. 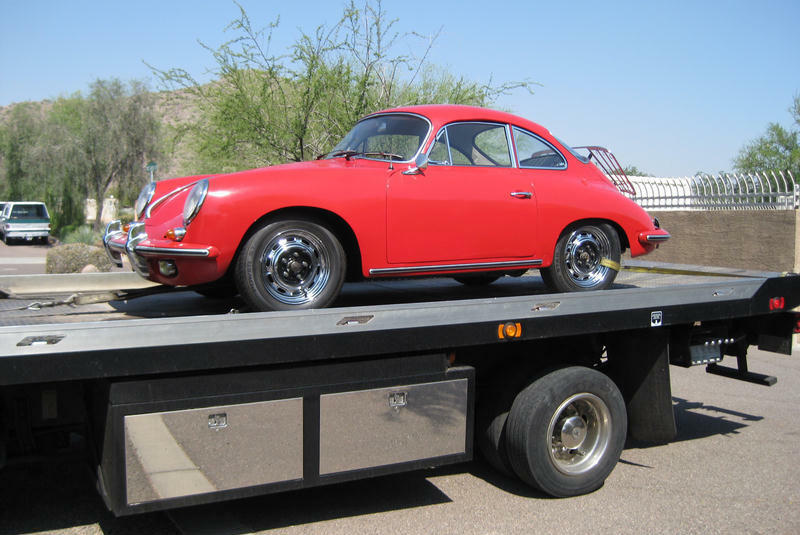 I learned a few things about getting a 356 Porsche towed, and the tow guys taught me some more things! Following are some pictures and some pointers. 1. 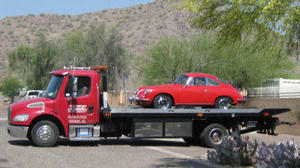 First, there are tow companies who specialize in towing/moving high value vintage cars. 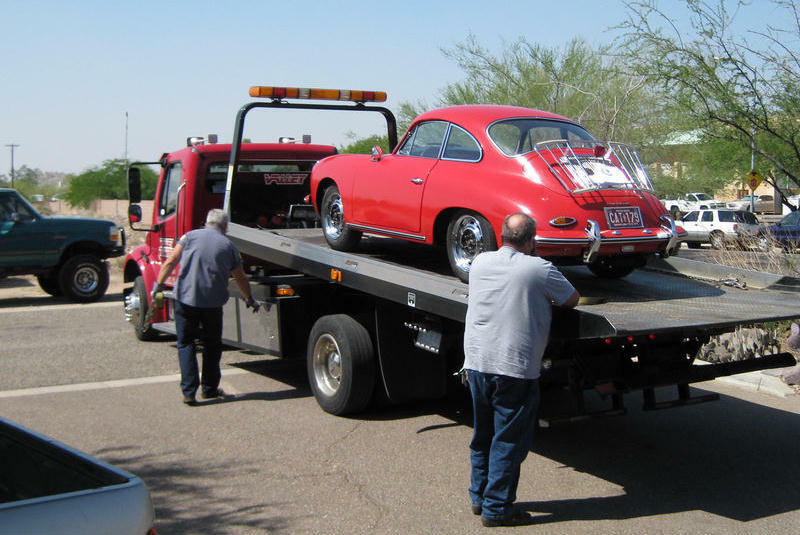 They know what they are doing and most do all they can to insure that your car gets to it's destination with no problems. 2. 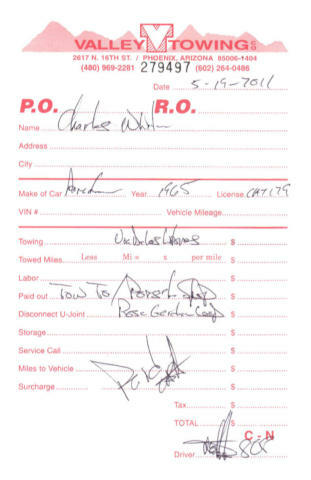 Ask your repair shop for a recommendation. 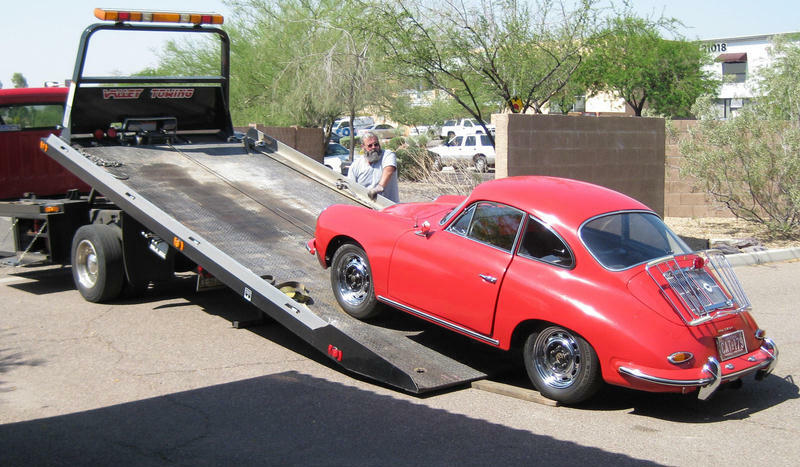 Most repair shops have cars towed in on a regular basis, and they know which companies to call. 3. 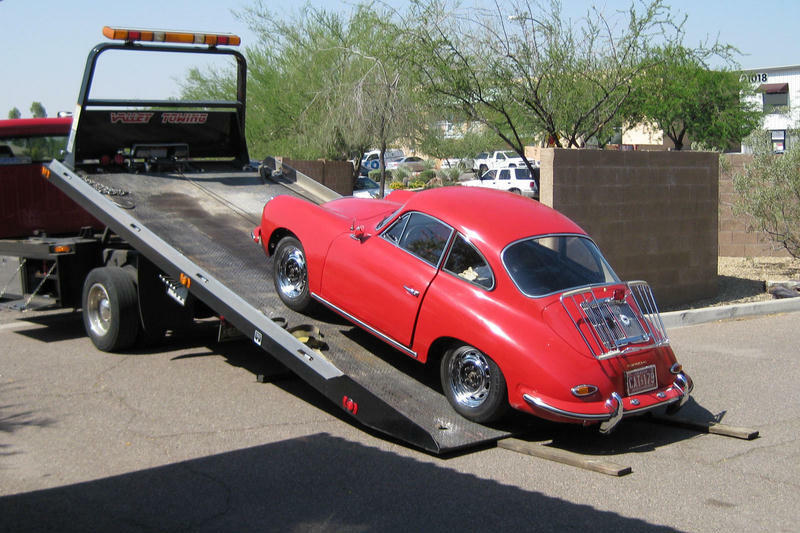 Insist on a "flat bed" tow truck, one where the flat bed can be lowered to ground level, and your car can easily be winched onto the bed. 4. 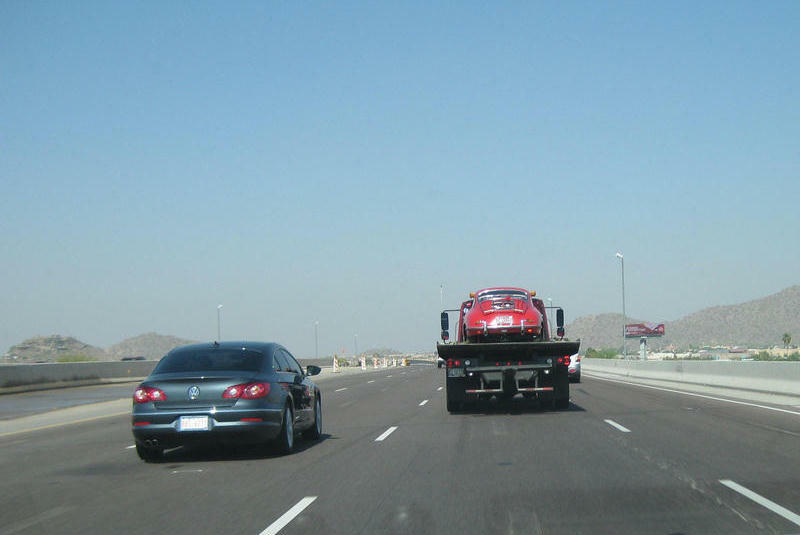 Ask them to use straps instead of chains and metal hooks when the car is winched onto the tow truck! 5. 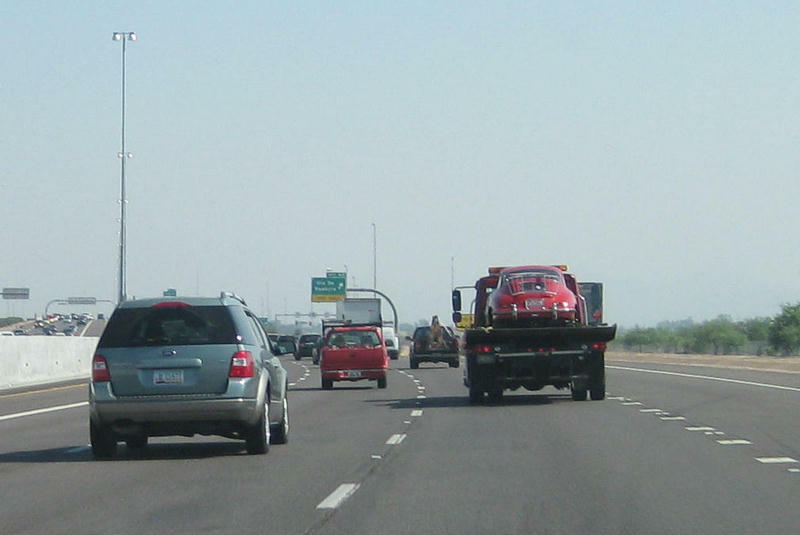 Ask them to be particularly careful with your front license plate, and your rear bumper guards to prevent the licence plate from being bent and your rear bumper guards from being dragged on the ground as the car is pulled up on the bed. 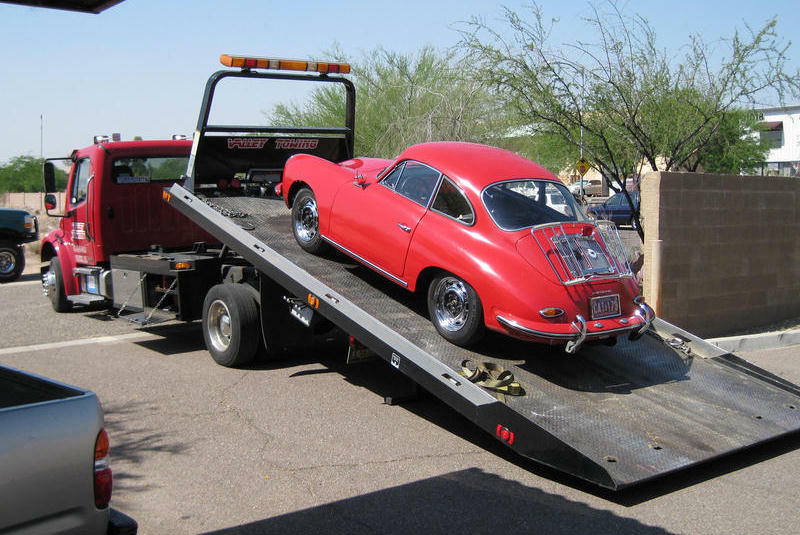 Not sure the stock tow hook on a Porsche is safe! 6. Ask them to strap the car down with straps instead of chains and metal cables! 7. Once loaded, follow them to your destination. 8. As a precaution, I took pictures of all sides of my car before they picked it up. 9. I gave them the address of the shop with specific directions on how to get there. 10. Upon completion, I tipped the tow guys for their good work! 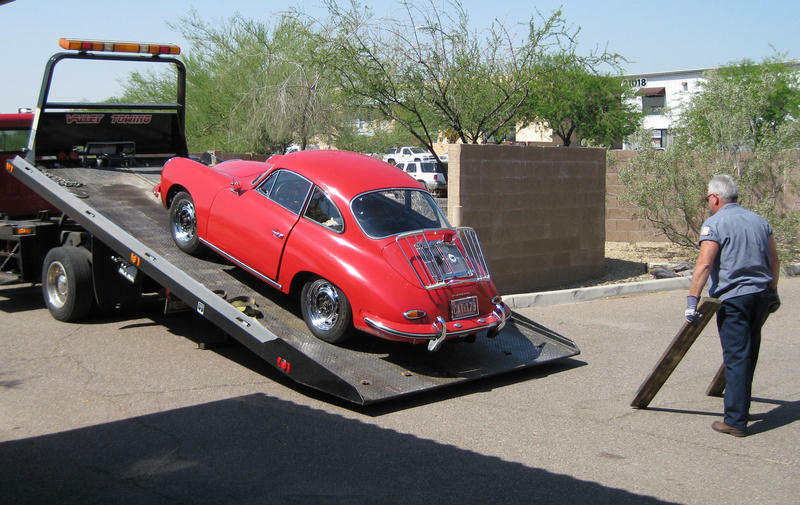 My 356-C arrived at the shop with no dents, no problems, and on time! 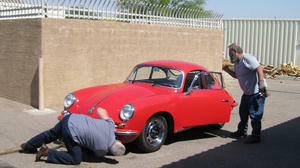 The two guys were very careful and appreciated my concern for my 356! I was very pleased with the whole experience. They did a great job and it was a great relief to me! 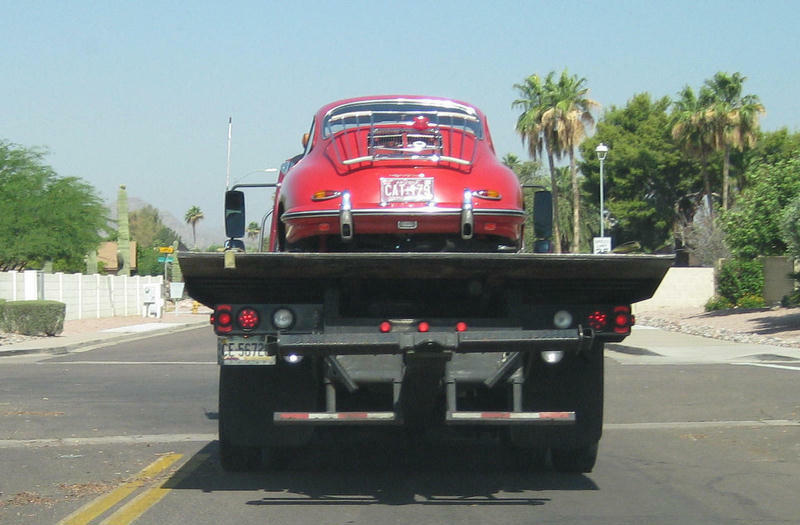 And to you guys who've never had your 356 towed, it can be done safely and without damage to your car. 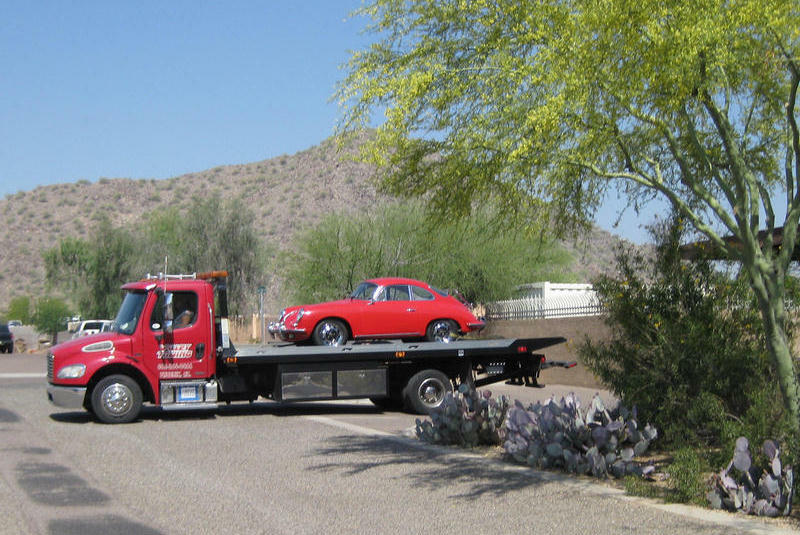 To you guys in the Phoenix area, I highly recommend Valley Towing. Reach them at 480-969-2281. 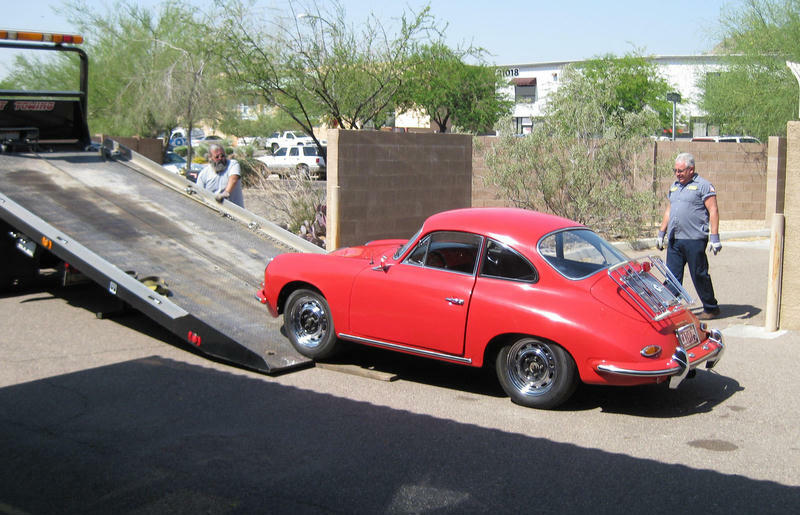 1965-C Coupe, Loaded up headed for the shop! 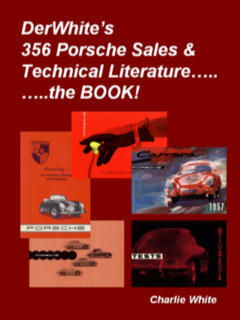 Owner never lets 356 out of his sight! This is NE Phoenix/Scottsdale area. Coming off the Freeway heading north! 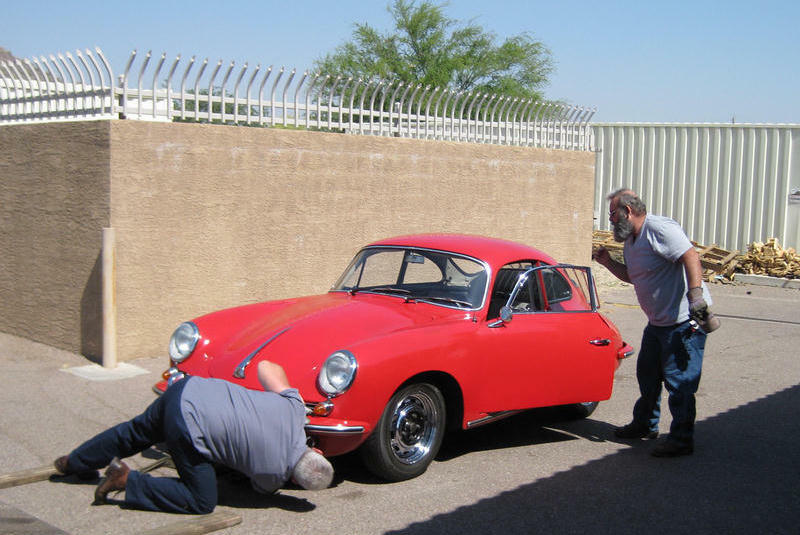 At the shop amongst beautiful Arizona scenery! 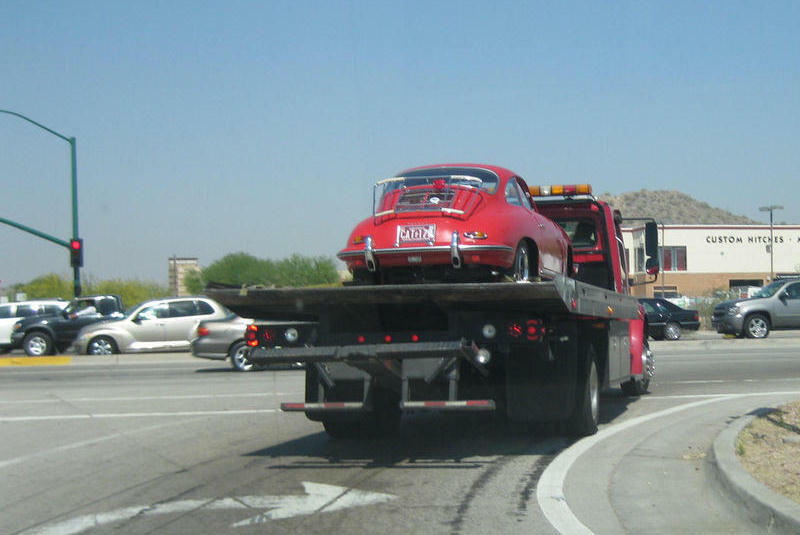 NOTICE: 356 is tied down with straps thru holes in the wheels. No metal hooks & chains, as requested! Flat bed tilts, than slides back! bumper guards from hitting the ground! Almost all the way down!!! Removing the straps! No metal hooks or chains!!! No dents! No dings! No problems! permission of the author of this website. Website first posted 5/19/11, updated 1/15/14.